Needs just 7 x 11 in. (18 x 28cm) of bench space. Reaches maximum temperature in just 8 minutes. Embedded heating element ensures even heat distribution. Temperatures are held within ±5°C (±9°F) at 371°C (700°F).Uses eddy current device for improved stirring control at low speeds. Starting torque overcomes static friction of stirring mechanism. Reaches set speed immediately. Includes an integral ring stand holder to accommodate a 1/2 in. diameter (1.3cm) support rod. Maximum load 20 lb. (9.1kg). Recommended for use with glass vessels only.With enameled diecast aluminum case. Square 7 x 7 in. (18 x 18cm) stainless-steel top plate with porcelain coating. Overall dimensions: 71/4L x 11W x 31/2 in.H (18 x 28 x 9cm). With one TFE-coated stir bar. 120V model is UL listed Needs just 7 x 11 in. (18 x 28cm) of bench space. Reaches maximum temperature in just 8 minutes. Embedded heating element ensures even heat distribution. Temperatures are held within ±5°C (±9°F) at 371°C (700°F).Uses eddy current device for improved stirring control at low speeds. Starting torque overcomes static friction of stirring mechanism. Reaches set speed immediately. Includes an integral ring stand holder to accommodate a 1/2 in. diameter (1.3cm) support rod. Maximum load 20 lb. (9.1kg). Recommended for use with glass vessels only.With enameled diecast aluminum case. Square 7 x 7 in. (18 x 18cm) stainless-steel top plate with porcelain coating. Overall dimensions: 71/4L x 11W x 31/2 in.H (18 x 28 x 9cm). 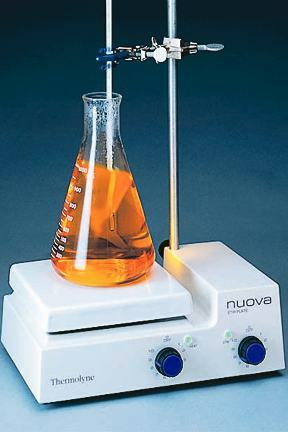 With one TFE-coated stir bar. 120V model is UL listed. 49 sq. in. (316cm2) plate surface. Stirring speed control from 100 to 1000rpm.